Looks like Drake won't be the only Canadian who started from the bottom to now be here on the red carpet at this year's MTV Video Music Awards -- the VMAs just announced that Montreal indie pop star Grimes will be a red carpet "fashion correspondent." MTV reported that Grimes -- also known as Claire Boucher -- will join Rachel Antonoff as hosts for the Red Carpet Report Sunday evening at Brooklyn's Barclays Center. "I am hard pressed to leave my studio at such a creative time of year, but deep in my heart I must know if Macklemore went to the thrift shop for his red carpet look," Grimes said in a statement. "Also stoked to be joined by co host Rachel Antonoff, cuz I would be terrified to do this alone haha." 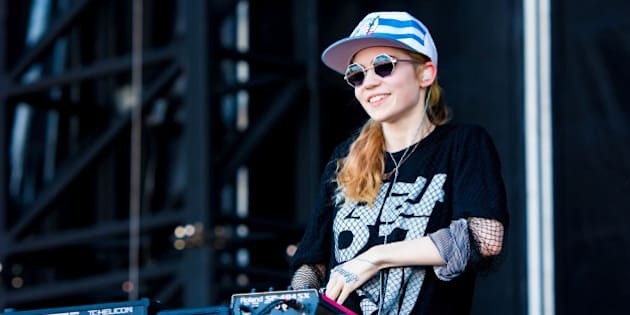 Grimes has a few shows slated for later this year including stops at the Austin City Limits Festival in October and a New Year's Eve gig confirmed for Mexico. While she continues work on the follow-up to her 2012 effort "Visions" she made headlines earlier in the year with a lengthy blog post entitled "I Won't Compromise Myself To Make A Living" explaining the sexism she's experienced as a musician. Last week the musician also posted to her blog showing a September issue of Vogue magazine featuring an article on her.